All the together, there is only about a $700 increase between a 2016 Hyundai Genesis Sedan and a 2017 Genesis G80 Sedan (since only the designation on the trunk changed, expect those badges to be stolen off of the G80 and to be sold on Ebay to 2015 and 2016 Genesis Sedan owners). $41,400 to start in the G80 and $68,100 to get into the G90. HTRAC AWD costs about $2,500 and the 5.0L V8 is about a $1,700 charge. The fuel economy numbers are so close for a majority of the variants that I’d say expect to see an average of 19mpg or 20mpg. 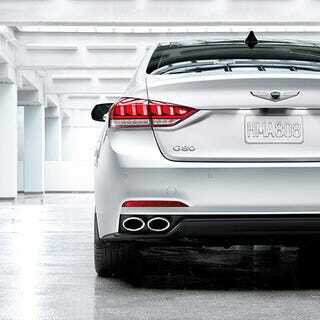 All I say is that it’s painfully obvious the V8 will be gone AGAIN after this model year for the G80. The G90 is also pretty meh about the 5.0L Tau V8. My friends, this engine as we know it is as good as gone. Looking at the economy of the 3.3T, I’m not seeing any room for a new V8. My guess is we can expect electric motors being added to all the range in order to get the next level of performance. I think the game plan is for Genesis being known for performance hybrids. Here’s an old speculation I made of the prices from months ago. Just so you can see what my thoughts were. You can go checkout the Genesis Motors website if you want more info, or ask me, it’s all good. I don’t like linking to nothing in particular. They haven’t updated the Hyundai site yet so you can still build the Hyundai versions and compare pricings.